Getaway magazine presents Getaway Events: interesting and unique events tailor made for outdoor and travel enthusiasts. You get to step into the story and experience the articles that you read and love! This is the first in a series of Getaway Events in partnership with City Soirée. The Cape’s fynbos fires this year were devastating. How has it affected the flora and fauna that depend on it? Botanist Rupert Koopman works as a biodiversity expert at CapeNature and is an expert on the Cape Floral Kingdom. 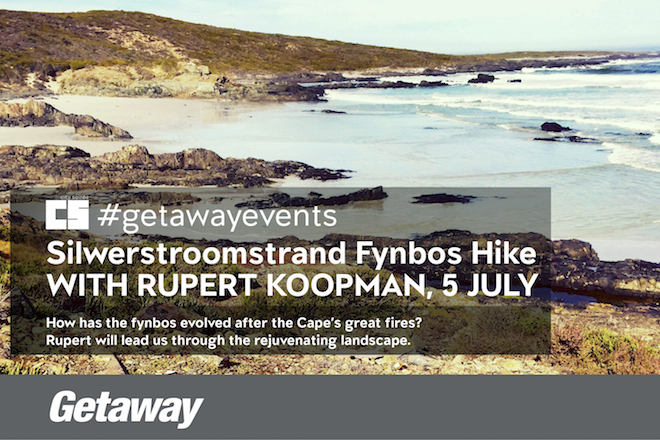 He will lead us on a 2-hour walk through the gorgeous landscape of Silwerstroomstrand in Mamre, close to Cape Town. Rupert was also selected as one of Mail & Guardian’s 200 Young South Africans in 2013 – we are definitely in good hands! So put on your hiking boots, grab a bottle of water and join us for a fun day of exploring. Rupert will be joined by Getaway editor Sonya Schoeman and avid environmentalist David Bellamy, who wrote about the effects of the devastating fires in Getaway’s thought piece in the May issue. We will meet up at 9:00 at Die Werf in Mamre, 40 minutes from Cape Town, where you can buy coffee and rusks and some other nibbles before having a short stroll through this historical town just outside of Cape Town. At 9:45 Rupert will take us to the starting point where our hike will begin. The hike is not difficult so anyone can join. Please remember to wear comfortable shoes, a hat and bring some water. This is a crowdfunded event and will be confirmed as soon as 20 people pledge so make sure to invite your friends! Each person who pledges will receive a digital copy of next month’s issue of Getaway magazine. Pledging closes 1 July 2015. Your pledge secures your ticket to the event.